The Ball Hogs are officially on the clock. 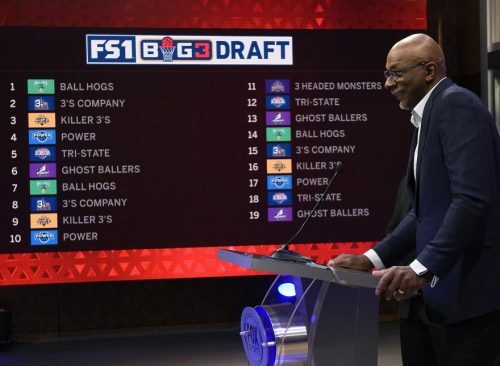 With the 2018 BIG3 Draft set for next Thursday, April 12 – live on FS1 – the league held a draft lottery Tuesday morning. BIG3 co-founder Ice Cube and commissioner Clyde Drexler joined Skip Bayless, Shannon Sharpe and Joy Taylor on FS1’s “Undisputed” to make the announcement. The Ball Hogs came up with the winning ping pong ball and landed the first overall pick. The Ball Hogs, led by captain Brian Scalabrine and coach Rick Barry, finished 2-6 last year, tied with the Killer 3’s for last place in the BIG3’s inaugural campaign. The Killer 3s, who also finished 2-6, have the third overall pick, just behind 3’s Company (3-5 last year). Power (4-4) has the fourth overall pick, followed by Tri-State (3-5) and the Ghost Ballers (4-4). Defending champion Trilogy (8-0), as a perk of winning the crown, gets to return its 2017 team intact – along with the new addition of Dahntay Jones. The 3-Headed Monsters (6-2), who lost to Trilogy in the Championship Game, got to keep two players from the 2017 roster (Kwame Brown and Mahmoud Abdul-Rauf). For that reason, the 3-Headed Monsters won’t have a first-round pick but they will fill their one open roster spot by picking fifth in Round 2. Overall, there are 19 open roster spots, with more than 75 players eligible for the draft – including 26 who played in Season 1. The Ball Hogs had the seventh overall pick in last year’s draft, and their first-round pick was Derrick Byars, who finished tied for 10th in scoring (13.4 ppg) and tied for fifth in total 3-pointers (13). The first overall pick in last year’s draft was Rashad McCants, who repaid Trilogy’s faith in him by playing at an MVP level for the undefeated champs. With McCants locked into the Trilogy roster, the highest pick from last year who is still available is second overall pick Andre Owens, who had a very strong opening season with 3’s Company. If Owens is not the first overall pick this year, will 3’s Company bring him back with the No. 2 pick? That’s one of the many questions that will be answered next week when the BIG3 Draft takes place. FS1 will carry the draft live beginning at 8 p.m. ET. The 2018 season tips off on June 22 from the Toyota Center in Houston, Texas – also televised live on FS1. The Draft Results Are In!